This year will mark Elie Bleu’s 40th Year. To celebrate this milestone, we have some amazing product introductions including the launch of a complete line of elite smoking accessories. For the first time, Elie Bleu has introduced a collection of Cigar lighting instruments. 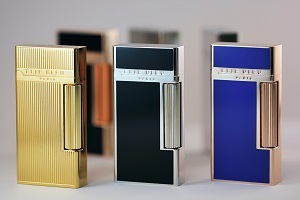 The first of the collections is the F-1 Wide Flame Flint Lighter available in six stunning finishes: Platinum plated with a satin finish, platinum plated with a mirror finish, gold plated vertical design, platinum plated with Japanese black lacquer, rose gold plated with Japanese black lacquer and rose-gold plated with Japanese blue lacquer. · Japanese Lacquer: Japanese lacquer is applied to the body of lighters like a resin; poured, sanded, poured and polished. · Platinum plated finishes: The most expensive metal used to make luxury jewellery in the world. It is the perfect weight, height and width for the cigar smoker. There is an easy adjust flame system which allows the flame to be adjusted in various conditions. The Japanese lacquer designs are as durable as they are beautiful. A custom 2-piece black leather carrying case is available. Purchased separately. For those who enjoy the experience the smoking. Indulge with Elie Bleu. Complete the passion. Springfield, VA (July 12, 2016) – Omar de Frias is proud to announce his third blend after Fratello was introduced in 2013 and Fratello Bianco in 2015. Fratello Oro is the company’s first time working with an Ecuador Connecticut wrapper. “We wanted a mild to medium cigar with a creamy after taste but that it also embodies the true nature of our company which is full flavor cigars.” Said de Frias. “We decided to take this project back to my homeland the Dominican Republic and work with La Aurora, one of the oldest cigar factories in the country.” I met last year with Guillermo Leon and Manuel Inoa and discussed some of my plans and interest in using some of the amazing tobaccos that factory has to offer.” “They opened their doors to their tobacco and manufacturing facility giving me free rein to explore and blend with their amazing inventory.” Said de Frias. Fratello Oro was blended with a Connecticut Ecuador wrapper, Cameroon Binder with Nicaraguan and Dominican Filler. Fratello Oro will be making its official debut at this year’s IPCPR show in Las Vegas. Cubariqueño Cigar Co. is proud to announce that it is releasing its second blend, Protocol Probable Cause, at the 2016 International Premium Cigar and Pipe Retailer (IPCPR) trade show in Las Vegas. The name, Probable Cause, stays true to the company’s law enforcement motif, with co-founders Bill Ives and Cancel both law enforcement officers. Production will remain at Erik Espinosa’s La Zona factory in Estelí, Nicaragua. Probable Cause will be available in two offerings, a round 5 x 52 Robusto with a closed foot and a 6 ½ X 48 Churchill semi-box-pressed, also with a closed foot. Probable Cause is elegantly wrapped in a stunning Mexican San Andreas Maduro leaf with a smooth, oily appearance. Its all- [probable cause cigar] Nicaraguan filler is enveloped by a Nicaraguan binder. “We are classifying Probable Cause as a medium-strength cigar with full flavor,” explained Cancel. The robusto will retail for $9.69 and the Churchill will have a M.S.R.P. of $9.89. Both vitolas will be available in boxes of 10. Also being introduced at this year’s trade show will be a line extension to the original Protocol release. The highly anticipated Protocol Lancero will make its official debut this summer in Las Vegas. The Protocol Lancero will stand in at 7 ½ x 38. The blends of all Lancero offerings must be tweaked slightly to maintain intended flavor notes and proper draw. The Protocol Lancero will undergo those modifications while continuing to use the Ecuadorian Habano Oscuro wrapper, Nicaraguan binder andall-Nicaraguan filler. It will be available in 10-count boxes. The price of the lancero has yet to be determined. “The Protocol Lancero is being introduced as a small-batch production depending on its success with possible increased production in the future,” said Ives. Cubariqueño Cigar Co. will be celebrating its one-year anniversary with a special event at Berkeley Humidor on May 21. “The Protocol Lancero and Probable Cause will be made available for purchase for our loyal customers at this event prior to the 2016 IPCPR trade show,” stated Bill Agathis, co-owner of Cubariqueño Cigar Co. and owner of Berkeley Wine and Humidor. 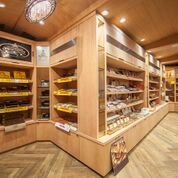 EASTON, PA--(Marketwired - July 11, 2016) - On Saturday, July 16th from 4:00 - 9:00 PM, Famous Smoke Shop, the leading online distributor of discounted premium cigars, specializing in offering the web's biggest selection of cigars at the lowest prices, will be rolling out the red carpet at Leaf Restaurant & Cigar Lounge in Easton, PA to welcome Olde Penn cigars, a new premium cigar selection blended at La Gran Fabrica Drew Estate in Nicaragua. The festivities will include in-store deals on Olde Penn cigars, beer samplings, Pennsylvania-inspired food dishes & cocktails, plus live music provided by Easton-based, blues-rock guitarist, John Cannavo, and his band, Free Agent Status. Life in Olde Penn was anything but pedestrian. Its people worked hard, played fair and stood up for what they believed in. When they met adversity face-to-face, they gave it a wry look and spit in its eye. Pennsylvanians business was building America. They followed their fathers into the coal mines, forged America's railways in their steel mills, tamed the Great Lakes, and 4,600 cigar factories (more than any other state in the Union), plus myriad Keystone State tobacco farms, satisfied the nation's appetite for a good smoke. Suffice it to say, Pennsylvania's roots run deep, hold fast, and remain strong. And it's in this unanimous, spirited and determined tradition that Olde Penn cigars were forged with the same grit and determination that's been coursing through Pennsylvanians veins since 1682. Olde Penn cigars are handcrafted with choice Nicaraguan longfillers skillfully rolled in a plush Connecticut-seed wrapper grown in Ecuador. The smoke is smooth, creamy, and mild-to-medium in body, while supplying rich layers of earth and spice. During the event, anyone who buys a box of Olde Penn cigars will receive a special Drew Estate Event Sampler and a rare, Liga Privada UNICO "Velvet Rat" cigar. Those who buy any other box of Drew Estate Liga Privada cigars will receive the Event Sampler plus a rare, Liga Privada "A" cigar. There is no cover charge for this event, but to attend, persons must be at least 18 years of age to enter the premises, and 21 years of age to drink. For more information, call Leaf Restaurant & Cigar Bar at 610-559-1336, or follow them on Facebook. Famous Smoke Shop is the nation's #1 discount retailer of premium cigars online, offering one of the largest selections of handmade cigars, machine-made cigars, cigar humidors and accessories. Famous offers the web's lowest prices on a wide selection of cigar brands including Acid, Davidoff, Macanudo, Romeo y Julieta, Ashton, Padron, Oliva and Perdomo cigars, and many more. Famous offers their customers the best prices on all premium cigars as well as friendly and knowledgeable customer service. EASTON, PA--(Marketwired - August 16, 2016) - Famous Smoke Shop, the leading online distributor of discounted premium cigars, specializing in offering the web's widest selection of cigars at the lowest prices, has announced the arrival of VUDU Blood cigars, the fourth installment in the VUDU cigars' lineup, and it comes with a very attractive price point. As the name suggests, VUDU Blood carries forward the themes inspired by the mystical Haitian religious practices, which are also reflected in the striking red and white humidor jar packaging adorned with line art drawings of snakes, skulls, and other cadaverous creatures. A fourth size, No.13, is a 5½" x 46 Corona presented in a bundle of 13 cigars with an MSRP of $3.80 per cigar. "I think they've hit pay dirt with this one," said CigarAdvisor.com editor, Gary Korb, during a recent tasting session of the new cigars. "The smoke is smooth, full, and well-balanced with a rich, earthy-cedary baseline augmented by flavors of leather, cocoa, roasted coffee and sweet spices on a peppery finish," he added. Korb also compared VUDU Blood to Jesus Fuego's highly-rated Sangre De Toro cigars, which are only sold at retail cigar stores. NEW YORK, July 6, 2016 – The Knickerbocker Hotel® and Club Macanudo® have announced a joint partnership launching the city’s premier alfresco cigar lounge called “Club Macanudo at The Knick” set at the legendary New York hotel’s rooftop bar, St. Cloud, opening July 7. The luxury rooftop experience pairs the finest handmade cigars with signature libations and small plates created by renowned Chef Charlie Palmer within a sleek outdoor urban retreat overlooking the famed Waterford Crystal Ball in Times Square. Nestled in the plush Broadway Pod overlooking Times Square, guests at Club Macanudo at The Knick will enjoy a connoisseur’s selection of world-famous premium cigar brands including Macanudo®, Cohiba®, CAO® and others, along with signature cigar and drink pairings, cut and light demonstrations and special events, amidst sweeping skyline views. Club Macanudo, located at 26 East 63rd Street, is an exclusive cigar lounge in the heart of New York’s Upper East Side providing an elegant oasis for smokers and non-smokers to conduct business, enjoy a romantic evening, or catch up during a stylishly casual night out with friends. Expanding its presence to The Knickerbocker strategically places Club Macanudo in a scenic outdoor location that caters to New Yorkers and elite travelers from across the globe. St. Cloud, enviably situated on the southeast corner of 42nd Street overlooking Times Square between Broadway and Bryant Park, occupies 7,800 square feet with three plush corner Sky Pods and offers a seasonal menu created by Charlie Palmer. This summer, St. Cloud’s menu premiers an eclectic selection of Chef Palmer’s exquisite eats paired with innovative cocktails including the Siberian Summer, made with Stumptown Cold Brew Coffee. Exclusive to the Club Macanudo at The Knick lounge are Applewood-smoked pork belly skewers with a rum glaze. Culinary offerings are expertly paired with a progressive cocktail program and craft bottled beers. Guests enjoy sophisticated entertainment featuring an understated yet eclectic mix of cirque-like, biergarten and speakeasy fun, while curated music selections set the tone for extraordinary experiences high above the city year-round. Rooftop entertainment programming for the year ranges from the monthly-themed Full Moon Party series to the most anticipated New Year’s Eve extravaganza with the best views of the famous Waterford Crystal Ball standing just 150 feet away. The Knickerbocker is managed by Highgate, a premier hospitality investment and management company whose growing portfolio includes more than 100 properties in gateway cities worldwide. FelCor Lodging Trust, a real estate investment trust, owns The Knickerbocker Hotel. Club Macanudo is owned by General Cigar, a leading manufacturer and marketer of handcrafted cigars for the premium market in the US. The company is owned by Scandinavian Tobacco Group. Committed to delivering cigars of the finest quality, General Cigar’s skilled artisans produce Macanudo®, Cohiba®, La Gloria Cubana®, Partagas®, CAO®, Punch®, Hoyo de Monterrey®, Excalibur® and several other leading premium brands in the company’s Dominican, Honduran and Nicaraguan factories. In addition, the company cultivates proprietary tobacco which is used exclusively in its blends and has a dedicated R&D practice that develops new varieties of tobacco and revitalizes vintage seeds. Based in Richmond, VA, General Cigar sells through wholesalers and retailers in the US. 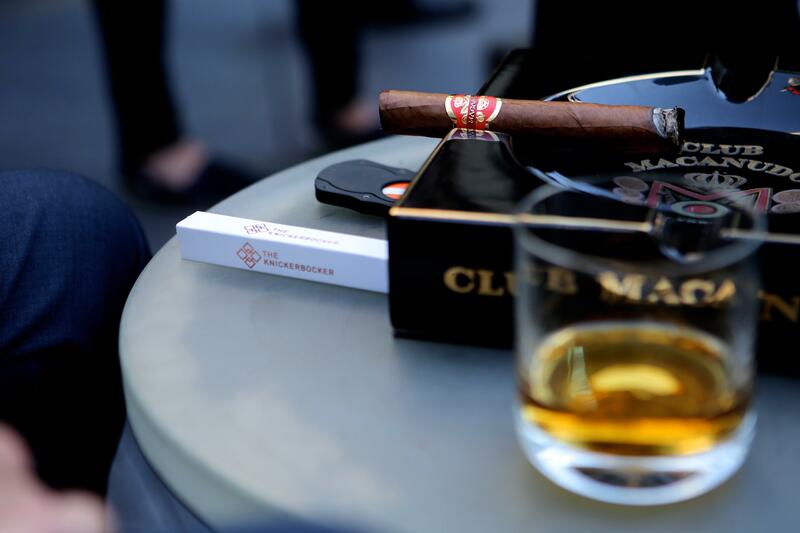 General Cigar also operates Club Macanudo®, a cigar bar in New York City. Read more: www.cigarworld.com. Highgate is a premier real estate investment and hospitality management company widely recognized as an innovator in the industry. Highgate is the dominant player in U.S. gateway markets including New York, Boston, Miami, San Francisco and Honolulu. Highgate also has an expanding presence in key European markets through properties in London, Paris, Barcelona, Vienna and Prague. Highgate’s portfolio of global properties represents an aggregate asset value exceeding $10B and generates over $2B in cumulative revenues. The company provides expert guidance through all stages of the hospitality property cycle, from planning and development through recapitalization or disposition. Highgate also has the creativity and bandwidth to develop bespoke hotel brands and utilizes industry leading proprietary revenue management tools that identify and predict evolving market dynamics to drive outperformance and maximize asset value. With an executive team consisting of some of the industry’s most experienced hotel management leaders, the company is a trusted partner for top ownership groups and major hotel brands. Highgate maintains corporate offices in New York, London, Dallas, Chicago, and Seattle. For more information, visit highgate.com. FelCor, a real estate investment trust, owns a diversified portfolio of primarily upper-upscale and luxury hotels that are located in major and resort markets throughout the U.S. FelCor partners with top hotel companies to operate its properties under globally renowned names and as premier independent hotels. Additional information can be found on the company’s website at www.felcor.com. There was a great CAO cigar that came in a red lacquered box. One day it was gone. Everyone assumed it was sleeping with the fishes. A certain crew of guys who smoke CAO made us an offer we couldn’t refuse. They said bring back that wise guy cigar, or else. So we delivered the goods. 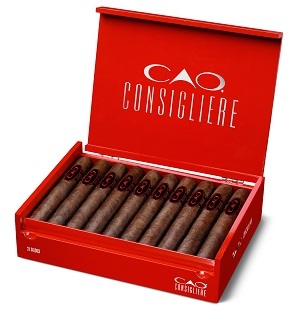 CAO Consigliere is a straight sequel -- the five-country blend is the same as before, the one that made it to Cigar Aficionado’s Top 25 list in 2006. Consigliere is handmade in Nicaragua, with a Brazilian Mata Fina wrapper, bound with a Honduran leaf and features a blend of Nicaraguan, Dominican and Colombian leaves. This is a bold cigar with flavors of espresso, wood and spice. Rick will hit the road later this year, doing events across the U.S. to celebrate the return of this tough guy smoke. Ernesto Perez-Carrillo always set out to lead the industry in innovative and groundbreaking ideas. Today we unveil a group of cigar lines that each have a unique and distinct set of parameters within the Series. Each Series is based on a greater concept that defines the cigars that make up that specific series. Ernesto Perez-Carrillo and the entire E. P. Carrillo Cigar Co. family introduce to you The Series. Perez-Carrillo, as a name, has been known in the Cigar Industry for years. Ernesto is a Junior and his father before him and the family before that all have been integrally involved in making cigars for generations. This is what was the inspiration for the Family Series of Cigars. These cigars are generations of know how, poured into unique blends and culminate as the creations of Ernesto Perez-Carrillo himself. Only these cigars are allowed to bear the name Perez-Carrillo and each vitola is an homage to someone within the family. Cigars that are the pride and joy of the Perez-Carrillo family history. Hours spent on tobacco farms and fields looking for the perfect leaf. Hours spent on the factory floor blending to create the perfect cigar. Ernesto Perez-Carrillo spends these hours creating the Elite Series. Cigars that are worth the name Elite, due to the use of unique tobaccos and blends. A master achievement in flavor, character and time spent for each cigar to be called Elite. Ernesto Perez-Carrillo is widely believed to have created the BIG RING gauge craze of today while he was with his prior company. Today, at EPC Cigar Co., Ernesto is at it again with the Dimension Series. He adds to his claim to fame by having created the INCH line and since it is all about dimensions, his next claim to fame is the smaller ring gauge, Interlude and the non traditional sized Rebel. The Dimension Series of cigars is all about the size and how that size relates to the smoker’s experience. The Classics are the type of cigars we all know well. Those cigars that are traditional in make and style. They are akin to a favorite sweater or pair of comfortable shoes, a smoke that we crave anytime of day. Ernesto Perez-Carrillo reinvented tradition with the Classics Series by adding his personal touch to a traditional approach. The Factory series arises from the daily work on the rolling tables of Tabacalera La Alianza, Ernesto Perez-Carrillo’s factory in Santiago, Dominican Republic. Ernesto’s relentless pursuit of efficiency and sustainability of each process is paramount to the development of each cigar in the Factory Series. It is a series designed to achieve optimal use of raw materials that have been meticulously selected, processed, rolled, aged and classified by Ernesto himself. Tabacalera La Alianza offers exclusive products with unique tobacco kept under the most rigorous quality control to keep a high level of consistency. Personally reviewing each cigar and seeking excellence and attention to detail, nothing escapes the vigilante eyes and mind of the master himself. On August 8, 2016, FDA’s deeming regulations went into effect, extending FDA’s authority over tobacco products to cover cigars, e-cigarettes, and all other tobacco products. Although additional requirements relating to cigar manufacture, packaging, labeling, and promotion will be implemented in the future, one of the more immediate impacts of FDA jurisdiction over the cigar industry will be at the import level. Cigar imports are now subject to FDA review. As a result, brokers will need to provide additional information about the cigar product and wait for FDA to review this information and ultimately release these entries. Essentially, product release goes from a one-step process (release by Customs only) to a two-step process (release by Customs and by FDA). Like other FDA-regulated products, FDA reviews and subsequent entry releases can be as quick as a few hours after receipt of information, or can take days/weeks if information transmitted is incorrect, incomplete or FDA has questions about product compliance. Cigar importers should be aware of the potential for an import delay. WASHINGTON, D.C. - The three major cigar and tobacco industry associations filed suit Friday against the United States Food and Drug Administration's "Deeming Rule." The Cigar Association of America, International Premium Cigar and Pipe Retailers Association, and the Cigar Rights of America are asking the District Court for the District of Columbia for a declaratory injunction "vacate, set aside and enjoin the enforcement of the final rule" because it is violates numerous federal statutes as well as the federal rulemaking process. A full copy of the filing, which details nine counts against the FDA and the United States Department of Health and Human Services, can be found here. "Just over one month ago, our three associations pledged to work together to develop the appropriate response to the FDA's new deeming rule. After a thorough and detailed legal review, we are challenging this unlawful regulatory action in federal court to protect the statutory and constitutional rights of our industry and its members. The fact that all three of our organizations are acting in once voice speaks to the urgency and seriousness of this action," said Mark Pursell, CEO of the International Premium Cigar and Pipe Retailers Association. FDA's unlawful designation of tobacconists who blend finished pipe tobacco or create cigar samplers of finished cigars as "manufacturers," which subjects those businesses to greater regulation than if they were "retailers"
FDA's incorrect decision to regulate pipes as "components" or "parts" rather than as "accessories"
"The FDA ignored the law to craft these expansive and sweeping regulations and cannot justify many of the arbitrary and capricious regulations it purports to enact," said Glynn Loope, Executive Director of Cigar Rights of America. "This lawsuit is a specific and detailed challenge to the FDA's unprecedented assertion of rulemaking authority. "We are acting in one voice to protect the legal rights of our industry at all levels, from the manufacturer, the community retail tobacconist, to the adult patrons of cigars." Speaking about the lawsuit, Cigar Association of America President Craig Williamson said, "We all worked in good faith to inform and educate the FDA on the unique nature of our industry, its members and our consumers. We hoped the FDA would craft a flexible regulatory structure that accounted for the uniqueness of our industry. Instead, we got a broad, one-size-fits-all rule that fails to account for how cigars and premium cigars are manufactured, distributed, sold and consumed in the United States. The FDA exceeded its statutory authority and violated the federal rulemaking process when crafting this set of broad and sweeping regulations. This challenge asserts nine violations of federal law and rulemaking authority. We are asking the court to enjoin the enforcement of this unlawful regulatory scheme. We are confident that when the court reviews our case on its merits, we will prevail." Distant from even the most primitive modes of transportation, Indonesian Macassar is arguably the most difficult ebony in the world to procure and one of the world’s most beautiful exotic woods. In a fitting tribute to this extraordinary work of nature, the artisans of Cohiba have created Cohiba Macassar, a new collection that lends itself to extravagant smoking occasions as readily as it does to life’s most treasured moments. Only the finest leaves were selected to meet the exacting standards of taste and aesthetics set forth for Macassar. As such, this super-premium expression is made solely of proprietary tobaccos, each aged for more than four years including a year of finishing in Dominican rum barrels. The blend of Cohiba Macassar is centered on a supple Connecticut Havano wrapper grown in a micro climate that helps to achieve a richer, more flavorful tobacco, yet with far less yield than traditional plants. To deliver a refined wrapper with barely perceptible veins, only the finest seco leaves are chosen for Cohiba Macassar. The blend is made with a proprietary Dominican seed cultivated by Cohiba’s agronomists in Mao, complemented by a Nicaraguan Jalapa leaf grown exclusively for Cohiba. The Connecticut Broadleaf binder is aged six years to impart a mellow flavor and optimal combustibility. 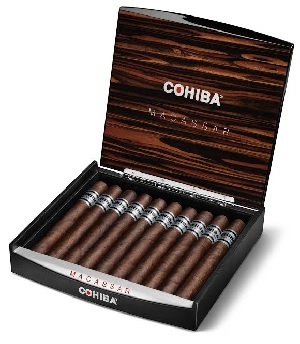 Cohiba Macassar brings forth nuanced notes of wood and spice. The flavor is distinctive and unmistakable, bearing subtle references to other blends in the Cohiba portfolio. Handcrafted in the Dominican Republic, Cohiba Macassar will make its debut fine cigar shops nationwide beginning in August. This remarkable collection will be a full-time addition to the Cohiba portfolio and will be launched with three sizes, each protected in 10-count boxes. The Bailey Family is one of the oldest names in America’s tobacco heritage. For 150 years the family has passionately cared for the land they cultivate in Keysville, Virginia, becoming one of the largest tobacco operations in Virginia. 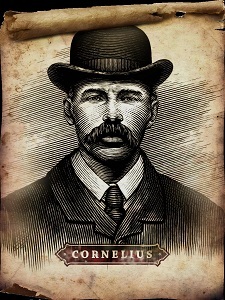 Cornelius & Anthony Premium Cigars is named after Cornelius Bailey, the first known Bailey family member to farm tobacco in the southern piedmont section of Virginia, and Cornelius & Anthony’s founder, Steven Anthony Bailey. masterfully crafted cigar is nothing short of magnificent, and the ideal addition to any connoisseur’s humidor. 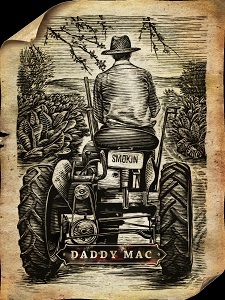 The Daddy Mac is the company’s second release. Daddy Mac is a celebration of Steven Bailey’s father, Mac Bailey. It is produced at the La Zona factory in Estelí, Nicaragua and is made in 4 sizes that are presented in boxes of 20. Each box displays an illustration of Mac Bailey tending his tobacco fields. Cornelius & Anthony will debut 2 additional lines, Venganza and Meridian, this July at the 2016 IPCPR Show. The Venganza delivers an unmatched experience. This rich and flavorful powerhouse has a silky Ecuadorian wrapper that is highlighted by its Nicaraguan filler tobaccos. Venganza starts with a blast of bold flavor. This spice forward blend has a lingering sweetness and a long smooth finish that highlight its bold complexity. It is the pinnacle of balanced perfection. Venganza is rolled at the La Zona factory in Estelí, Nicaragua. 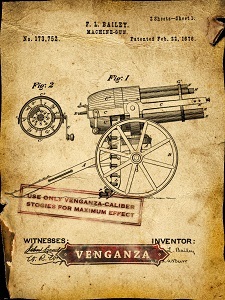 Also produced in 4 sizes and presented in boxes of 20, the venganza boxes feature an illustration of the 1876 patent form for The Bailey Machine Gun. Produced in Estelí, Nicaragua, Meridian is a cigar that will stop you in your tracks. Produced in 4 sizes and presented in boxes of 20, this beautiful Rosado has an oily Ecuadorian wrapper that surrounds Nicaraguan and Dominican filler tobaccos. The blend has rich notes of spice and wood with a lingering sweetness that creates a creamy refined balance. Meridian is a solid medium-bodied cigar that delivers an experience you will want to revisit again and again. 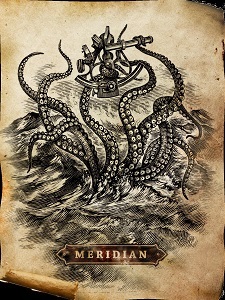 Cornelius & Anthony invites you to navigate your way to the new Meridian, and never stop exploring. La Gloria Cubana is launching two new lines, one created solely for sale at brick and mortar cigar shops and the other developed for internet and catalog retailers. Serie R Esteli made Cigar Aficionado’s list of the Top 25 Cigar of 2014. With a 91 rating, the magazine called the line “one of the best La Glorias in years.” This outstanding collection is now being extended to include a new Maduro offering created exclusively for brick and mortar retailers. Made with the same Nicaraguan-forward blend that won the brand critical acclaim, the new expression is wrapped in rich Connecticut Broadleaf to deliver a cigar that’s medium in strength, deep in sweetness and brimming with leather notes and spice. La Gloria Cubana Serie R Esteli Maduro began shipping in July, and is available in three sizes. Each box contains 18 cigars. With large ring vitolas, deep, rich flavor and a bold Nicaraguan blend, La Gloria Cubana Serie R Black debuted as an unbeatable addition to the Serie R line. 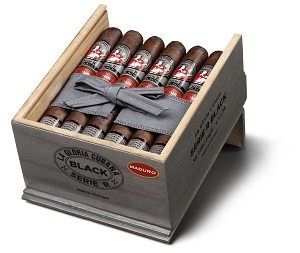 The trend continues with the addition of La Gloria Cubana Serie R Black Maduro. This deep and full-bodied smoke delivers a powerhouse of flavor, filled with pepper, earth and coffee notes and the slightly sweet, creamy taste that can only be found with an aged Maduro wrapper. With an SRP of less than $8, Serie R Black Maduro has all the makings of a top-selling new smoke for cigar lovers who demand Nicaraguan flavor at an accessible price. La Gloria Cubana Serie R Black began shipping in July and is available in three sizes through internet and catalog retailers only. Each box contains 18 cigars. The legendary Hoyo de Monterrey brand continues its bold march into the future with an intriguing, limited edition collaboration called La Amistad. The blend was developed by AJ Fernandez, the Cuban expat cigar maker best known for producing highly-rated cigars in Nicaragua. 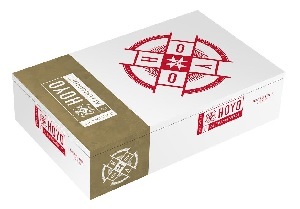 Hoyo La Amistad is bold and full-bodied, and showcases the artisanal cigar making techniques and modern packaging of the new Hoyo launched earlier this year. Named for the camaraderie forged when creating this exciting new release, La Amistad means friendship in Spanish. La Amistad is brawny and robust, with notes of leather and spice. The wrapper is a bold Ecuadoran Habano, bound with a Nicaraguan leaf cultivated by AJ Fernandez in Esteli. The blend features powerhouse Nicaraguan tobacco from Esteli, Ometepe, Condega and Jalapa. 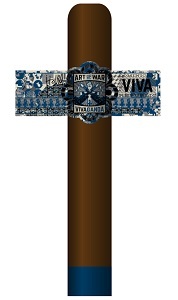 The Art of War, handmade at La Aurora, along with all of the company’s releases, will be featured in four sizes: Robusto (5” x 50) $8.50, Corona Gorda (6” x 47) $9.50, Toro (5.5” x 54) $10.50 and Gran Toro (6” x 58) $11.50. Enveloped with Stalk-Cut Connecticut Broadleaf over a binder of Ecuadorian Sumatra, and filled with various priming’s from Colombia, Dominican Republic and Nicaraguan. Finishing off the construction, the head cap is adorned with a pigtail and the foot covered in Dominican Candela, a tease to the consumer about the journey that lies ahead. Named for the epic military and philosophical strategy book by Sun Tzu’s The Art of War, one of its key strategic tenets is to “Appear weak when you are strong.” The use of a candela foot is both a visual and consumptive homage to Master Sun. This release will ship immediately to several accounts with a nationwide release date and launch event soon to be announced. One-of-a kind venue opened its doors in the epicenter of Miami’s Downtown Brickell area. MIAMI – Casa De Montecristo by Prime Cigar & Whiskey Bar in Brickell-Miami officially opens its doors to the public after an invitation-only “Gold” carpet event attended by VIPs, city officials and local celebrities. Prime Cigar’s first location in Boca Raton, set them apart as the premier cigar bar in South Florida. Prime Cigar is partnering with Tabacalera USA to unveil a one of kind cigar and whisky lounge. The new establishment looks to thrive in the heart of Miami’s business district, at Brickell’s newly built 1100 Millecento residential tower. Prime Cigar’s founders, Jason Reznik and Ryan Leeds, celebrated in grand style, as they treated over 300 event guests, to an evening of live music, cocktails, catered food, and a variety of select Montecristo cigars. Guests were also treated to a special Johnnie Walker tasting. Hosted by a Master Whiskey expert, the tasting featured a traveling showcase trunk, with every expression of the brand. Casa De Montecristo by Prime Cigar & Whiskey Bar finally became a reality after Jason and Ryan along with Javier Estades, Head of Premium Cigar Operations for Tabacalera USA, cut the ceremonial ribbon with oversized scissors. Ryan and Jason were later presented with a “Salute” by Miami Mayor Tomas Regalado. Local celebrities in attendance included Tito Puente Jr., world renowned Cuban- American artist Carlos Navarro, and VH1 reality star and recording artist Jane Castro. The location of the 4,700 square foot Casa De Montecristo by Prime Cigar & Whiskey Bar, was strategically chosen. Brickell has become one of Miami’s most dynamic neighborhoods, where business and nightlife seem to live together seamlessly. The upscale bar and lounge, will features a walk-in humidor, full-bar stocked with exclusive and hard to find whiskeys, members’ lounge, and private board room. Custom furniture and design elements (which exude simple elegance) will please the cigar aficionados, or those looking for a unique experience, for a rare whiskey, craft cocktails, or a nightcap. The establishment also features a “vintage collector’s room,” which houses unique and vintage cigars. One important feature that sets Prime Cigar apart is the state-of-the-art air control system. This innovative system provides 80 tons of A/C, and replaces 100 percent of the air constantly. This system was of great importance to Leeds and Reznik, as they wanted customers to enjoy themselves in the upmost comfort. Prime Cigar was born out of close bond between father and son. Ryan Leeds’ father passed away in a tragic accident, which led Leeds to ponder the meaning of life, with friend and business partner, Jason Reznik. Ryan retired from his career in banking which spanned two decades, and put his efforts into creating Prime Cigar in Boca. Inspired by the lessons and experiences of his father, Ryan created a space which celebrates their love of cigars, good whiskey, and luxury comforts. Founded in 2010, Prime Cigar & Wine Bar is a cigar bar and lounge featuring premium cigars, top-shelf spirits and fine wines. 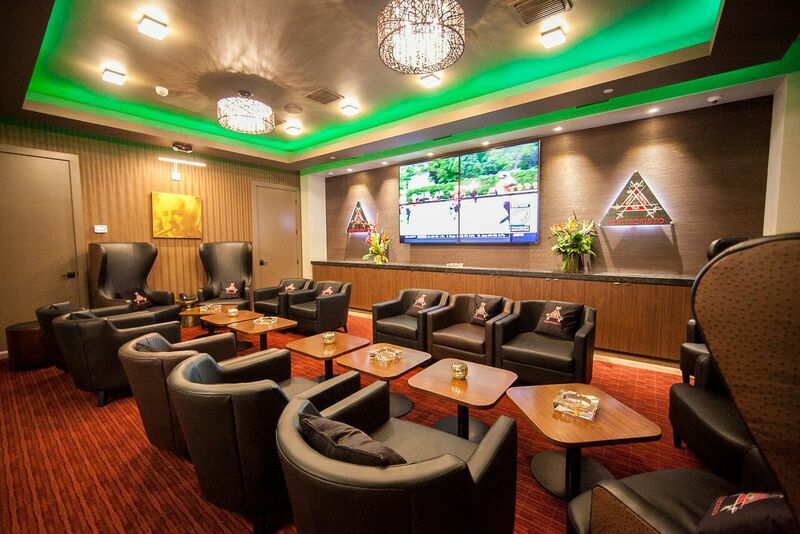 Prime Cigar delivers a sophisticated relaxation experience to all its guests and boasts a state-of-the-art air control system, ensuring a comfortable smoke-friendly environment. Creativas Group Inc. provides public relations and marketing counsel to national brands, recognized special events and leading non-profit organizations. For more information: www.creativasgroup.com.Follow us on social media @CreativasGroup. 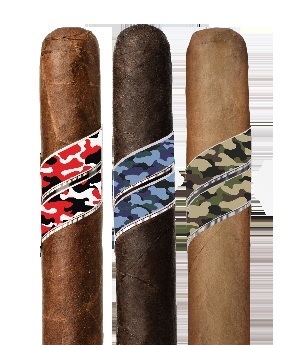 EASTON, PA--(Marketwired - July 21, 2016) - Famous Smoke Shop, a leading online distributor of discounted premium cigars, has announced a new line of cigars in conjunction with RoMa Craft Tobac. The cigar retailer specializes in offering the web's widest selection of cigars at the lowest prices -- and their newest selection is named Intemperance WR 1794. Already made immensely popular due to an early, limited edition release with CigarDojo.com, RoMa Craft has added multiple sizes within the brand, all of which will be made for sale only through Famous Smoke Shop. RoMa Craft's Intemperance line has been on the market since 2012 which includes the Intemperance EC XVII, and Intemperance BA XXI. Whiskey Rebellion 1794 cigars by RoMa Craft Tobac take their name from the protest known as the Whiskey Rebellion, which began in 1791 under George Washington's presidency. Washington's Treasury Secretary, Alexander Hamilton, introduced a tax on all distilled spirits in an attempt to lower the nation's debt without raising the nation's already-high import taxes; the Whiskey Tax was the first tax on domestic goods in United States history, and was roundly -- and vehemently -- opposed by many rural American communities. RoMa Craft Cigars owner Skip Martin embraced this outrage and insurrection as the inspiration for the newly expanded cigar line. "Our forefathers believed the Whiskey Tax to be illegal, under the idea that there was no local representation," said Martin, "and they stood their ground. What this cigar represents to me, then, is that when faced with tyrannous taxes and regulations -- we must resist." It's his nod to how Hamilton's tax resulted in conflict between citizens and law enforcement, when 500 armed men in Western Pennsylvania rose up in dissent; Washington called militias from the surrounding States to quell the rebellion, though no violence erupted. Skip noted, "but the message that these Whiskey Rebellion patriots sent, was received." The Whiskey Tax was eventually repealed by Thomas Jefferson, after federal agents struggled to enforce it. Whiskey Rebellion 1794 cigars feature a complex blend of Nicaraguan and Dominican longfiller tobaccos, an Indonesian Besuki binder, and Ecuadorian Habano wrapper, and comes in multiple sizes -- each named after an instrumental political figure who had a hand in the creation and abolition of the Whiskey Tax. After sampling the new Whiskey Rebellion cigar, Famous Smoke Shop Copywriter & Cigar Advisor Jonathan Detore said, "All of us here are extremely excited about taking on this incredible line of cigars. The smoke is bold and flavorful, with a profile that will appeal to many cigar smokers. With so much history behind this cigar, especially in the state of Pennsylvania where our company is based, we are especially proud to make this a long-term addition to our wide selection of premium cigars." Intemperance WR 1794 Cigars will debut Monday, July 25 at the International Premium Cigar & Pipe Retailers' 84th Annual Convention and Trade Show; available exclusively at Famous Smoke Shop, it will arrive for sale in five sizes: a 4 x 46 Hamilton, 4 ½ x 52 Jefferson, 5 x 50 McFarlane, 5 x 56 Bradford, and 5 ½ x 54 Washington. The majority of the line offers 24 cigars per box, while the 4 x 46 Hamilton vitola offers 30 cigars in each package. With Famous' full discount pricing, customers will enjoy this new offering with individual retail prices ranging from $6.15 to $8.00 per cigar. The first shipment will arrive at Famous Smoke Shop's warehouse in August; and while the company has expressed that the new brand will be a consistent offering for the foreseeable future, Whiskey Rebellion cigars will be available in limited quantities. Those interested in learning more about RoMa Craft cigars, Whiskey Rebellion 1794 Cigars, or Famous Smoke Shop should visit www.Famous-Smoke.com or call 800-564-2486. Springfield, VA (June 6, 2016) – Fratello Cigars is proud to announce the Bianco Boxer and the Bianco IV began shipping last week to 10 retailers. The first event with the new cigars was held at Delaware Cigars May 29th. Bianco Boxer retails for 10.00 Per Cigar. Bianco IV retails for 9.75 Per Cigar.